Why are some people happier, more confident, and more successful than others? Mastering your personality is key to achieving balance, success, and confidence. Throughout your whole life, Campaigner, you’ve always sought answers. From global issues to your friend’s daily struggles, your restless mind has worried, questioned, and wondered. And you can’t really stop it. Because you care. The same quest for understanding has led you here, to these very pages. But this time it’s a bit different. This time it’s about something you’re perhaps a bit scared to analyze. It’s about who you are. Like many Campaigners before you, you probably came to our website just hoping to learn something fun about yourself. You did. You liked it, so you kept reading. Then, at one point or another, something clicked. You realized that this just got much more serious than you initially thought. Because there’s that one question you’ve always quietly asked yourself. You’ve asked that question when you were feeling misunderstood yet again. You’ve asked it when you were doubting whether your chosen path was the right one. And you’ve asked it when you saw people find happiness in something that brought none to you. You wanted to know whether there were any others out there who thought, dreamed, and struggled like you – and if so, was there any chance you could learn how they coped with challenges like the ones you were facing? The answer is YES. We’re all unique, but we can also be more alike than it may seem at first. There are millions of Campaigners in the world – and drawing upon their insights and experience can be tremendously empowering. And this is where we can really help you. It’s so freeing to see words put to traits I’ve tried to understand for years. It makes understanding others just as helpful, too. Being able to harness my strengths has been a great step forward. On the other hand, accepting and growing in areas of weakness is eye opening. What more can we tell you? You’ve probably just finished reading the overview of the Campaigner personality. It’s quite detailed, and we hope you found it enlightening. However, you’re still yet to discover the remaining 95% of Campaigner insights. That’s not an overstatement. So far, we’ve barely touched the surface. We’ve spent thousands of hours combing through people’s life stories and experiences, analyzing hundreds of surveys, and testing a myriad of different approaches. We did all this so we could help Campaigners like you get the most out of life by truly understanding themselves and unlocking the true power of their often misunderstood and neglected strengths. Discover how to leverage your traits to grow as a person, and get where you want to go regardless of the bumps in the road. Learn more about how different personality types act, and what they are likely to expect from you in different stages of the relationship. Learn how to find and develop meaningful, fulfilling friendships not just with other Campaigners, but with every personality type. Discover your strengths and potential as a parent – including the analysis of the challenges you’re likely to face at each stage of development. Explore how you learn at various stages of your life and which of your personality traits can help or hinder you when learning. Get better at navigating the professional world and achieve your professional goals without compromising your integrity. Hundreds of testimonials say it all! Read on. People learn in different ways, so we’ve put together several options for you – you can pick whichever feels right to you. You’ll be able to upgrade at any point, if you choose to. The first option is our e-book, a 259-page Campaigner profile with the full growth roadmap. It comes in a convenient PDF format and is perfect for Campaigners who enjoy inspiring and thought-provoking reading, whether at home or on the go. The second option is a combination of our e-book and interactive online courses. You’ll gain access to additional assessments, advice, and research data for an entire year. You’ll be able to track your progress, make notes, and exchange advice with other Campaigners studying these materials. The third option is for those who wish to get profiles for all personality types. You can save over 60% compared to buying the profiles separately, and you’ll get the same access to Campaigner courses as you would with the second option. Download the full 259-page Campaigner profile. You’ll be able to read it on any device, whether it’s your computer, phone, or an e-reader. 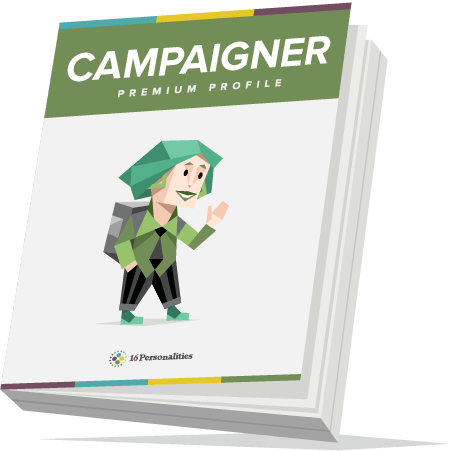 Download the full 259-page Campaigner profile and get access to our interactive Campaigner courses with lots of additional tests, tools, exercises, and research data for an entire year. 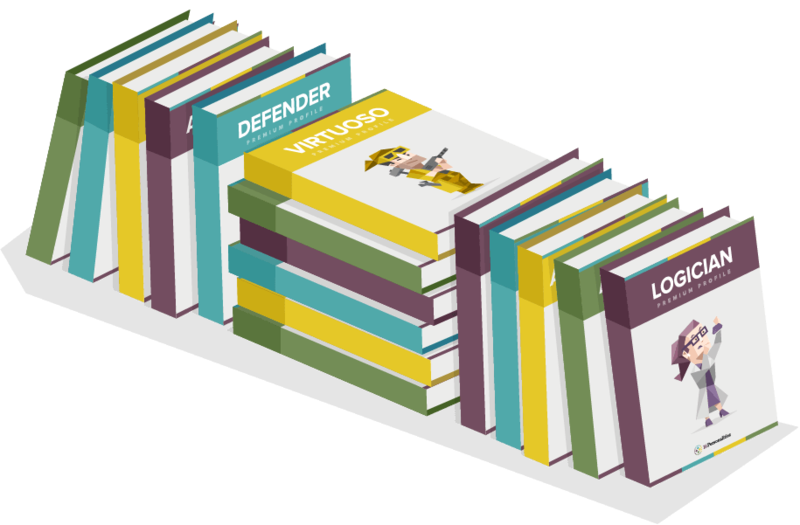 Download profiles for all personality types (3,600+ pages total) and explore interactive Campaigner courses with extra tools and materials for an entire year. If you don’t get exactly what you expect – for any reason – just drop us an e-mail within 30 days and we’ll refund your money, no questions asked. I wish I had found this sooner to better understand my combination of personality traits. From learning about yourself to your friendship, romance, education and career preference, the profile is spot on. Thanks for the wonderful insight and advice guys! This helped explain many traits that I just didn’t understand. I never understood why certain things about me were so different from others, and constantly felt misunderstood because of it. This changed that for me. I accept who I am confidently and securely. It was so accurate it was scary. I often wonder why I am the way I am, and find myself analyzing my personality and my surroundings. I finally found something that describes how I am feeling, and I will never stop learning and growing. Thank you. E-mail address What would you like to know? We’ll respond shortly. You can also e-mail us: support@16personalities.com. Are you ready to discover how to leverage your Campaigner traits to help you grow as a person – and get where you want to go despite the bumps in the road? In this course, we outline the five sources that you draw motivation from, and illustrate what happens when all those sources are balanced—and what to do when they become unbalanced. You’ll find plenty of pointers to living your best life in a balanced, holistic way to avoid falling victim to your “dark side,” as well as real-life examples and other tools for this personal development journey. You’ll also be able to practice applying this knowledge by completing over a dozen exercises aimed at the challenges you’re most likely to encounter as a Campaigner. Ranging from simple to-do lists to captivating scenarios and possible outcomes, these easy-to-follow exercises prepare you for the road ahead. And, if you’re interested in digging even deeper into various aspects of your personality and behavior, you’ll be able to do so with the help of many additional tools and tests included in this course. Whether you wish to assess your emotional intelligence or find out how Machiavellian you are, we promise you plenty of wonderful “a-ha” moments that provide personal insight on a profound level. There are few things Campaigners take more seriously in life than finding their soulmates. That’s why the more intimate knowledge of your personality type you have, the healthier and happier your intimate relationships can be. This course is designed to help you not only understand what traits you should be looking for in a significant other, but also ways to master your own desires and emotions. Our real-life examples, easy-to-understand insights, and personalized content will get you as prepared as possible for romance – you’ll learn how different personality types approach intimacy, what they seek in potential partners, and what they’re likely to expect from you in all stages of loving relationships. Whether you’re actively looking for a life partner or have spent many years in a romantic relationship, you’ll find this course enlightening and provocative. We should never stop learning, and Campaigners are often the first to promote this attitude – romantic relationships are no exception. By digging deep into the complex and diverse interactions of various personality types in a romantic context, you’re bound to gain awareness that can be a tremendous help in your love life. As well as our personalized and proprietary course materials and exercises, you’ll also gain access to an additional test aimed at helping you understand how you and your current (or desired) partner align on a variety of indicators linked to your attitudes and behavior in your relationship. Armed with this knowledge, you’ll not only feel more confident as a romantic partner, you’ll ensure your love connections are more fulfilling and authentic. It’s so easy to underestimate how vital having strong, stable friendships can be when it comes to living a fulfilling life and achieving your goals, whether personal or academic, professional or romantic. In this course, you’ll learn how to find and develop meaningful, fulfilling friendships not just with other Campaigners, but with every personality type. Campaigners can be intense and demanding friends – while your friendships can often reach a depth many other personality types find difficult to imagine, your inner fire can also become a destructive force if not wielded carefully. We help you explore core trends in Campaigner friendships, and discuss how you can use your strengths to develop the types of friendships you’ve been longing and searching for all your life. We examine what you’re likely to seek in your friendships, and what potential pitfalls you need to be aware of. We then dive deeper into your interactions with other personality types as a Campaigner, exploring specific aspects of compatibility, as well as ways to avoid imbalance in each combination – and highlighting warning signs and opportunities to watch out for. Finally, we wrap up the course with several exercises and tools aimed at helping you strengthen your current and potential friendships. Few challenges in life are as maddeningly difficult, yet as exhilarating, as being a parent. In this course, you’ll discover your strengths and potential as a parent during each stage of development, from infancy to adolescence, and explore ways you can use these strengths to achieve balance in your complex and ever-changing relationship with your child. You’ll find plenty of tips and ideas for strengthening the bond between you and your child in each unique life stage. For Campaigners, parenthood isn’t just about the challenge of raising a child to become a fulfilled and successful adult. It’s also a unique opportunity to look deep into yourself and find the right balance between competing forces – controlling destiny and accepting your child’s unique path, or encouraging an enlightened empathy during a life stage where your child simply isn’t able to practice this ideal. With these ideas in mind, we not only show you ways to be a more engaging and motivated parent for your child, but also provide advice on how to reduce stress and remain in touch with your true self – despite all the responsibilities and multitasking that parenting brings. We also include additional tools to allow you to gain insight into which personality traits your child is actively exploring, and to learn more about your preferred parenting style – and possible alternatives. There’s no single recipe for being a perfect parent, but this course can equip you with the knowledge to make it clearer, easier, and less stressful. Whether you’re still in high school, working your way through college, or learning on the job, our Academic Path course explores how you as a Campaigner learn at various stages of your life, and how your personality traits can help or hinder your educational pursuits. Achieving the right balance between your specific personality traits and preferred learning styles is key to a smooth and successful learning process, and this course will both explain why you as a Campaigner learn the way you do, and how to best use this understanding to your academic advantage. This course isn’t just for those in formal education, though. You’re curious, passionate, and relentlessly idealistic, but these qualities often struggle to reconcile a desire for personal transformation with the often career-oriented focus of so many accredited programs. That’s why we go beyond school and explore your attitudes and potential across a lifetime of self-directed learning, whether putting paint to canvas for the first time or, indeed, exploring yourself in these very pages. 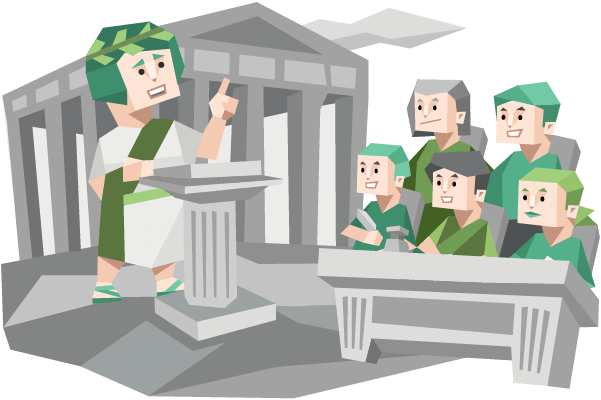 Alternative education such as homeschooling, trade school training, online courses, and work/study internships, are all part of today’s academic landscape, and you’ll discover which can be the perfect fit for your personality type. From the high school experience to lifelong learning, this walkthrough is guaranteed to be engaging, informative, and personally enlightening. Stuck in a rut? Not sure of the next step in your career? Get better at navigating the professional world as a Campaigner, and explore how you can achieve your professional goals without compromising your integrity. Many of your values and ideals are likely to be at odds with what the majority of others seek and expect in their careers, so having a deep understanding of your inner core is vital to avoid getting frustrated or thrown off the right path for you. The personal knowledge this course will bring is even more important if you’re drawn to a more unorthodox path – such as that of an entrepreneur or non-profit professional. There’s no single magical job that would make all Campaigners happy. But by learning what happiness and balance look like to your personality type, you’ll find it much easier to ensure that you get on – and stay on – the path that’s the best match for your unique set of goals, attitudes, and traits. We reveal all that, and more, in this course. Of course, there are plenty of factors outside your personality traits that have considerable impact on how good a fit a particular field or position can be. So, we’ve also developed and included a number of additional tests to help you understand what your individual core values and job preferences are. Finally, it’s always helpful to hear what paths other Campaigners have explored, and what challenges they’ve encountered. In our interactive Career Stories section, you’ll not only be able to explore stories submitted by other Campaigners, but you’ll also have the unique opportunity to share your own story and interact with others who choose to follow in your footsteps!